Happy Autumn everyone! The season is now in full swing, and I have to say, it's my favourite time of year. To keep you busy while you're snuggled up warm at home is this fabulous Details Special! This month is a real treat, filled with amazing real weddings (page 93), DIY ideas (page 156), 25 unique reception ideas (page 170) and much, much more. As Christmas approaches, everyone's watching the pennies, so we've decided to give our readers loads of chances to win amazing prizes this issue! From your wedding photography (page 169) to unique flowers (page 232), there's a prize for everyone. And that's not all – competition lovers should definitely check out our huge feature (page 146) filled with goodies – big and small – to be won! My personal favourite features this month are the 60 best hair ideas from real brides (page 86) and the amazing theme ideas (from page 239) – bang on trend and so inspirational! 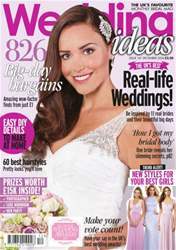 Make sure you check out page 182, too, and get voting for The British Wedding Awards 2015 – it's going to be a corker!